I dunno bout you but I love mixing my languages during speech …bietjie English here… bietjie Afrikaans there…. And mind you… I do know I am not alone here. English is my first language, Afrikaans my second. I also speak Xhosa and a tiny bit of Chichewa (Malawian language). So deal is this- if I know you’re say Afrikaans or Xhosa first language – I’ll make the effort to speak to you in your language… and most probably do the mixing thing where translations evade me. We live in a country with 11 official languages and countless more being spoken beyond that 11. If you’re Afrikaans speaking- I see an opportunity to brush up my Afrikaans. Similarly, if you’re Xhosa speaking – I see an opportunity to improve my Xhosa skills. So why am I telling you all this? Recently I was told by Mr Anonymous that it’s disrespectful and seems pretentious. Mr Anonymous‘ view is that I should just speak my first language… finish en kla. It shook me a little cos never has it occurred to me that the next person may consider this disrespectful and if Mr Anonymous thinks so… are there others who think or feel the same way? In the TEFL industry (teaching English as a foreign language) – it is common practice for non-English speaking students to do a course and simultaneously live for a period of time in an English speaking country. The idea being that one learns much better and faster being immersed in that culture or area where the language is spoken … having many opportunities to speak and practice the language out of class … facilitating learning. Personally, I think Mr Anonymous is a bit of a doos. Why can’t I mix my languages and why can’t I make the effort to speak to you in your mother tongue when it’s different from my own? I don’t intend any disrespect but have certainly become a bit more aware of people maybe thinking like Mr Anonymous. So now I’ve flippin started asking people if they consider it disrespectful. What I do consider disrespectful is when you’re sitting and chatting and people within the conversation starts speaking a different language others in company cannot understand. If you’re not part of the conversation and maybe passing by - it doesn’t count… here I make reference to speaking within the same company… what should be considered one conversation. 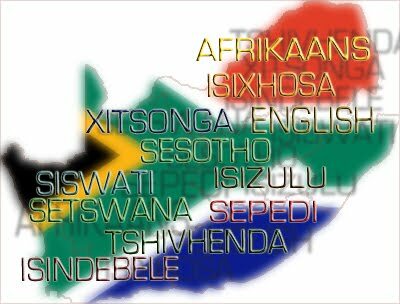 With 11 official languages to deal with already – maybe a better understanding of sensitivities will help us to actually communicate better. Please comment your views or experiences regarding etiquette when conversing in different languages. Much appreciated. Dankie ne. No, it is beautiful how you consider others buy speaking their language! !Jy is mooi, hahaha, ek het nou lekker gelag.